Before my OCD got the better of me and I started devoting unreasonable wads of my time to this blog's Star Trek-themed sister blog (www.beyondthefarthestblog.blogspot.com) I used to have more time on my hands. But sometimes it means a day like yesterday. 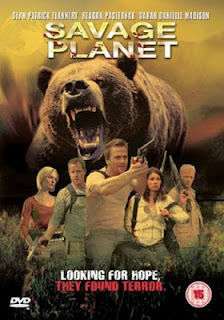 Savage Planet is a 2006 Sci Fi Channel original movie. Sorry, "original" and "movie" should be in air quotes. It's dreadful. Don't watch it. Not even for free like I did. I could barely tolerate it and my threshold for worthless schlock garbage is staggeringly high. See, in 2068, with the Earth just about out of air, a grab-bag of jerks and corporate slime-balls teleport to Planet Oxygen to track down more oxygen. That's not a joke, it's called Planet Oxygen. With me so far? Young Indiana Jones and Erica's Partner from 'Being Erica' (both above this sort of material) are the only survivors, and instead of oxygen they bring home a can of goop that re-grows all their damaged tissue. What good is regenerating if you can't breathe, I ask you? Well, my wife pointed out that maybe the guy regenerated with gills. It was the most logical thing I'd heard in an hour and a half. 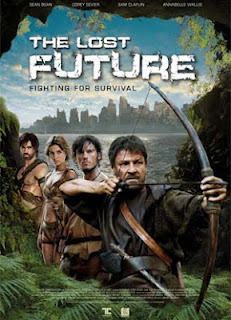 The Lost Future is a 2010 SyFy Channel movie (those are pretty stupid 'y's, by the by). What was wrong with Sci Fi Channel? In MY DAY (sorry, MyDy) we didn't think poor literacy was kewl. Poor literacy is the problem for failing humankind in this adventure, which after the first one was much more acceptable. Certainly it got off to a good start with a convincing CGI sloth-mutant attack on the jungle men and women of One Million A.D. (or thereabouts). Watch out, 'cause a scratch from sloth's claws turns one into a slavering Lord of the Rings orc! Do not attempt! It's not as fun as it sounds! The jungles are full of these orc-wolf hordes, with the jumping ability of the Morlocks in the most recent 'Time Machine' movie. Sean Bean came along on a raft ride with interchangeable pretty boys seeking the cure for all this were-wolfiness: Yellow MacGuffin Powder. An Alan Rickman-a-like has said powder in his decayed city. No hobbits are in evidence, sadly. It's not possible to take it as seriously as some other post-apocalyptic movies (like Book of Eli, where, again, the moral of the story is literacy) but it's no worse than an extremely inexpensive Waterworld. Plus it's mercifully shorter than the Riverworld adaptation I saw last year. Also I respect writer Diane Duane. Just saying it's not a total loss if that's your thing. That's SF wilderness survival films starring guys named Sean for you. You're welcome, Canada. READ A BOOK! Both of these movies are true stories!